have a dt lc 125 1982..and a fs1 1976...both are non riders for this moment..the fs1 vas stolen ..and beat up..and the lc have ignision problems..both are puc back in the rear of the shop..for better days..
other side i did today, slowly but surely. Do you perform a vacuum test on these? I recently bought an R5B and am wondering about doing the seals. It ran for a minute or less, twice, then a contact breaker failed. It looses about one psi of air per minute, and vacuum goes down pretty quick also, but not to zero. I haven't plugged the auto lube holes though. P.o. said one of the pipes was plugged with carbon, and he also replaced one piston, but didn't describe how it looked. Speedo says 11,000 miles. No mate, new seals , gaskets etc. Never had a problem yet. Do you perform a vacuum test on these? Hey Greg...I do leak down tests on my 2 strokes, it is common for the crank seals to go bad, especially on the old Kawasaki Triples. I can probably replace all the seals in the same time I've been futzing around with testing, haha. Is it silly to reuse head and base gaskets even if they haven't had any run time? The engine will need to be split to change the crank seals. You could prolly get away with reusing the base gasket but personally, I wouldn't reuse the head gasket. Do you buy Yamaha parts, or is aftermarket good, too? The factory stuff is more costly, but if it's better then it's worth it. I have a tube of Yamabond that is two or three years old, and the tube says best used within one year. Anyone ever used it successfully beyond that time? It's only ten bucks, but, ten bucks is ten bucks and I'd rather not toss it if it's still good. I have a yamaha from the old days, but updated it to now. I like working on bikes, but dislike carbs. Yes I know how to clean and balance and tune carbs, but EFI is where it's at. Hence the EFI XS650. I have a NA 165 HP 87 FJ1200.....f'r is a blast to ride. I had nitrous on it but it broke clutch parts. It is 1314cc now I should add. Well I finally finished the 350 a/c engine. Ready to put in a bike. I'm very happy how it turned out. Even built a little stand for it. I've got 3 more motors to go. That is nice. Mine's about to come out and apart. Crank bearings and seals, and all gaskets are on the way! Anybody want to tell me about how the rods can be a little sloppy on the crank in an R5 and all will be well? Mine are at .35 mm of play and the spec is .3. My 74 RD250. I bought it just after it had finished 2nd in the 250 production TT in one of the closest finishes in TT history. I took it to lots of wins in sprinting and was runner up in a big drag race event in the junior drag racing class. Following this, I took it to several British Land speed records which still stand to this day due to specification changes in the class. I last raced it in 1979 with a final win in a 250cc racing class sprint. Thanks for the cool pics. Thanks Ken, have you seen my latest wheels ? The Ferrari will have to go. hahaha. 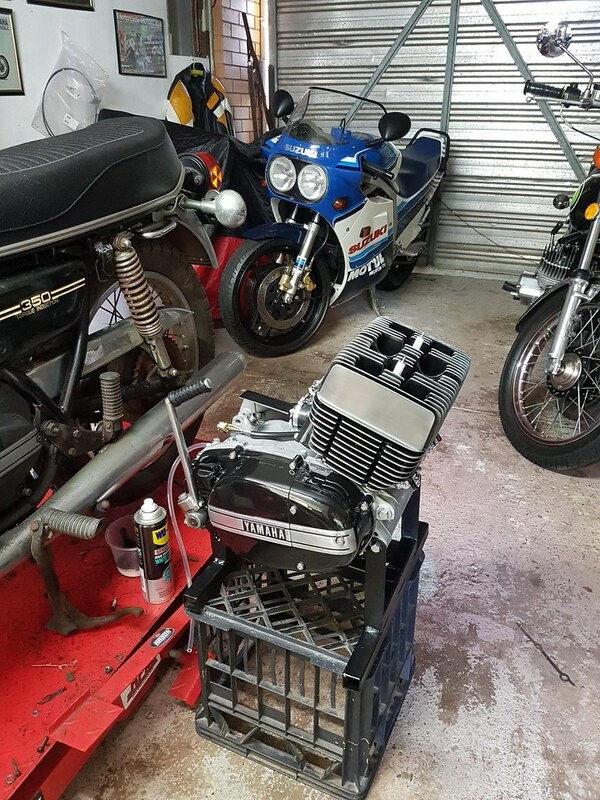 What's a good brand of piston and rings to use when doing a rebuild on the R5/RD350? OEM are really good and from memory go up to 1mm O/S in 1/4 mm increments. They're cast . Mitaka (cast ) are cheaper and are ok too. Then theres wossner and wiseco forged pistons . Fairly expensive but have a good name.. Theres others but thats the only only ones ive used. Here is a couple of pics of my cafe style 1975 RD350. Fairly stock engine other than YZ125 reeds and Spec 2 chambers, racetech cartridge emulators and springs, 520 conversion, wider than stock DID shouldered rims, drilled rotor with EBC pads and flipped forks, RD400 tank and steel tail section. Pretty good handling bike despite me going a bit too large on the tire sizes, tight/stiff frame with quick turn-in just a bit uncomfortable for long rides(the riding position and hard seat doesn't help much in that regard). While not a polar opposite of the CB400f, definitely a different engineering approach, simple and raw as opposed to complicated and refined. Thank you, I see you have a H1 and a 350lc, two great smokers! Thank you too. My current project is a 74 rd350 and im making a td styled race replica out of another . The motor i just did up id for the race bike. This is after I wiped out the rust I loosened with a screwdriver! There was a good quarter inch of oil and sandy gravel caked on the lower front part of cases. One of the outer bearings does not spin so it's a good thing that breaker contact released when it did! Whew! Found some NOS Pistons and rings for not too much on feebay. When I took it out the kick starter gear assembly was kinda wiggly in the case; is that normal? Crank is off to economy cycle for a rebuild. I've found them a bit wiggley too but once the clutch covers back on it holds it in place.